The primary support for each ESR will be their main supervisor and Doctoral Studies Panel (DSP). In addition to the formal supervision structure, each ESR is required to maintain a Personal Career Development Plan (PCDP). The purpose of such planning is to ensure that the ESR’s work is clearly focused on achieving their research and broader professional goals. This structure plays a major part in informing the direction of their PhD research and in their training and empowers the ESRs to take ownership of their projects. These plans also help the ESR to develop key skills that will be invaluable for both their current research and their future career prospects. The template used for the PCDP can be downloaded here . The main supervisor will take overall responsibility for the research training of the candidate (as outlined in the European Charter for Researchers). S/he will guide them in specialist matters, such as the scientific state-of-the-art, key research tools, and dissemination strategies to support publication in the best international journals. The ESR will be registered for a PhD at the academic institution of the main supervisor or co-supervisor. The main supervisor will have a regular schedule of meetings with each ESR, at least once every fortnight. Academic co-supervisors will have a similar frequency of meetings (via phone, skype, etc. if necessary) with the ESRs to ensure progress towards a doctoral degree. A co-supervisor from the participant hosting secondments. An expert who can influence the direction of research. The ESR will report to the DSP on her/his progress every 6 months. The DSP will work mainly by telephone/video conference/ networking platform, although face-to-face meetings will be possible in training weeks and workshops. 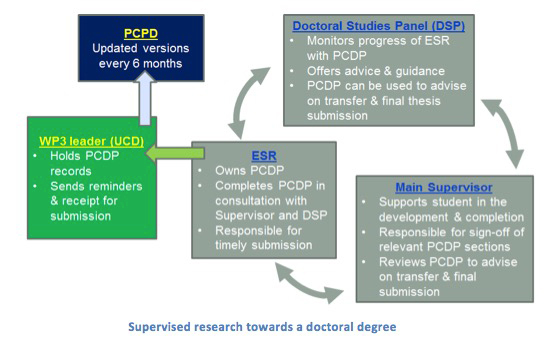 The purpose of the DSP is to support and advise both the candidate and the main supervisor throughout the doctoral programme by monitoring the progress of the candidate and providing advice and support on research and training. The main supervisor will consult with the DSP for major decisions. The DSP also plays a major role in the rare cases where the relationship between candidate and main supervisor breaks down.